Everybody has fun bouncing up and down on a trampoline as a kid. In your teenage years it may have become ‘uncool’ to do that anymore, but today we’re telling you this needs to change. A trampoline session is a great workout to build into your regular fitness routine as an adult. It is also a whole lot of fun. We all know bouncing on a trampoline will make you go up and down, but did you know a regular session can help you burn some serious calories? Trampolining in your backyard or living room might not conjure up the same feeling of a epic pursuit like climbing a mountain or running a marathon, but it can be a great way to shed pounds. At its core, trampoline use is defined as rebounding exercise. According to NASA – a group that knows more than a little about airborne activity – rebounding exercise is 68% more efficient than jogging for burning calories. That means an hour on the trampoline shall actually see you burn more calories than 1 hour spent jogging. Another great benefit of trampolining is the boost to circulation and cardiovascular health. This is especially important for adults – as while kids are often sliding, swinging, and hanging upside down on jungle gyms – even adults who are fit may rarely be bouncing, jumping, or rebounding as part of their regular workouts. Trampolining is great for this. Your heart will benefit from increased exercise, and your lymphatic system – a collection of tissues and organs that relies on body movement to function effectively – will get a really rigorous workout as a result of you bouncing up and down. As your immune system also depends on the lymphatic network, trampolining will also decrease your risks of colds, flus, and other viral infections. This alongside the overall benefits of greater circulation due to the rapid rebounding movement, including greater blood flood, increased oxygenation, and detoxification of your body’s cells. Every form of bipedal exercises makes use of your legs. From running to cycling, skiing to soccer. While each form of exercises is great, the benefits of each can vary considerably. That is why a trampoline can be so great on your legs, as the G force pressure sustained throughout regular trampolining can increase bone density, and strengthen your skeletal system as a whole. This is beneficial for people of all ages, but can be especially helpful to seniors who may have more brittle bones. As well individuals who have osteoporosis, or who regularly face other discomfort from leg and joint pain. The basics of trampoline exercise are very simple, hop on and bounce up and down! Beyond the basics, it is useful to allow a little time before and after use, to ensure you use the trampoline safely, and get the most out of its use. Before starting, gently shake out your arms and legs. Also circulate your shoulders, hips, ankles, and toes, and gently rotate your neck. Once you’ve finished your session, it’s good to stretch out your body, paying special attention to your legs and ankles, as they will have sustained the most pressure while jumping. Tramopoling is very safe overall, but it’s also important to keep in mind some safety tips. Everybody knows to stay in the center of the trampoline and away from the edges, but also look to keep your body centered as you jump. Try to jump and land with your ankles flat, your knees bent, and your upper body loose but also positioned straight and upright. Doing this will decrease the risk of an annoying injury like a stubbed toe or sprained ankle. It’ll also ensure your form gives you the greatest results in terms of calories burned, bone density built, and circulation of oxygen and blood throughout your body. 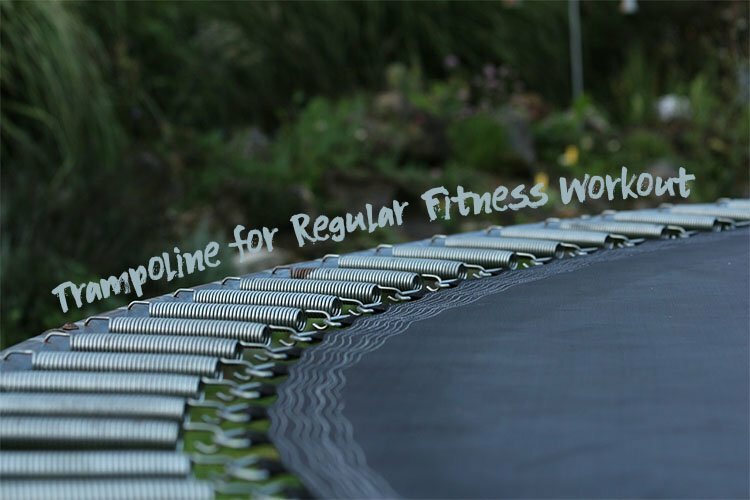 There are a variety of fitness trampolines on the market. This is great news, as there’s a lot of flexibility when it comes to finding the best fit for you. It’s always good to be mindful of some considerations as you shop. If you’re as tall as a professional basketballer an indoor trampoline may be impractical. Similarly, if you’ve the muscular build of a weightlifter then a heavy duty trampoline may be ideal. All up though, the most important thing is to seek out a trampoline that looks like fun. Your trampoline sessions will get your heart pumping, be vigorous, and a little tiring. But they should always be a ton of fun throughout. Buy a model you love, and you’ll have fun throughout all the ups and downs of life while trampolining.